It really doesn’t matter what type of business you are running (local based or internet), consumer reviews are going to play an important role in your business and customer decisions. Now more than ever consumer reviews are changing the buying habits of customers and more people are going online to research products and services before they buy. What’s even more interesting is to see how much of an influence consumer reviews are on the customer. These reviews don’t even need to be from friends or family, or even real to make a big influence! Take a look at these mind blowing statistics on how big of a role reviews play out in the buying process for customers and how much they can influence good or bad reviews for a company. As mentioned, it really doesn’t matter what type of business or service you have, it’s now more important than ever for you to engage in social activity and be able to follow up with customers on their questions, comments and especially their reviews. This will allow you to get ahead of any issues down the road while also catering to your audience of customers and providing them with extra value. 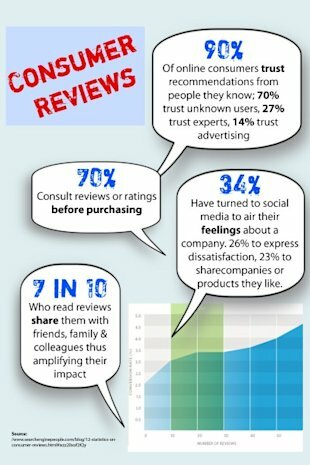 How Consumer Reviews Affect Online BusinessThanks go out to TestimonialMonkey for the infographic.